The concept of a Labor Exchange was developed by G. B. De Bernadi of Independence, Missouri. 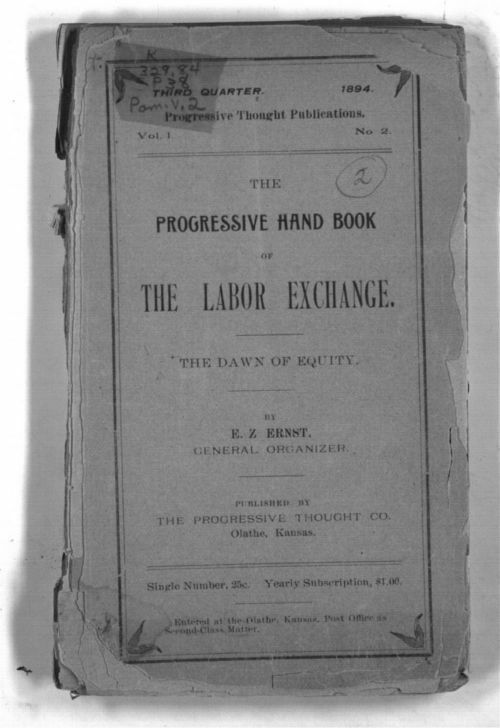 This booklet was compiled by E. Z. Ernst who was a general organizer for the Labor Exchange. The booklet contains lectures by Ernst, several items by M. G. Weaver and De Bernardi as well as information about the purpose, membership, by-laws, etc. of the Labor Exchange, which was described as a benevolent association "organized for the purpose of employing the idle men and women at useful labor and to distribute the wealth created equitably among the producers who contribute in the production of the necessaries and luxuries of civilized life." The booklet was published by the Progressive Thought Company of Olathe, Kansas.